Polityka’s Passport for Julita Wójcik! ’This is an award for the Rainbow made of flowers that was placed in the centre of Warsaw and soon became one of the symbols of the city. For consistently proving that life and simple everyday activities can be an art, too,’ this is how the granting of Polityka’s Passport to Julita Wójcik was justified. 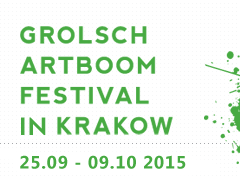 As you may remember, Julita Wójcik – a Gdańsk-based performer and artistic event author, was one of the guests of last year’s edition of the Grolsch ArtBoom Festival, during which, along with Jacek Niezgoda, she created The Mound of an Unknown Male Artist, Female Artist.